The DMD-470 Series bridge amplifiers are ac powered signal conditioning modules with triple isolated voltage or current outputs for load cells, bridge type sensors and strain gages. Both models have dual zero/tare functions. Zero is used for normal bridge balance and the tare feature allows up to 68% of the input to be offset and still achieve full output span. 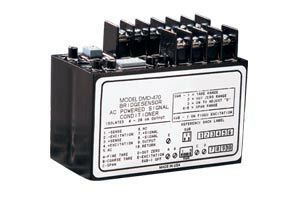 The DMD-475 has an isolated voltage output; the DMD-476 is similar, but has an isolated 4 to 20 mA output. Both models have input ranges of 5 to 50 mV for a full scale output (0-10 V or 4-20 mA).